UNSURE OF THE DESIGN AND LAYOUT OF YOUR SIGN? The Rennicks Design Advisory Service offers an unparalleled depth of experience, working with the client at all stages to arrive at the best possible solution. Using the latest computer aided design (CAD) packages, our teams of design and graphics specialists offer expert advice, while providing drawings and layouts for all signage projects. In addition, Rennicks’ team of experienced project managers can offer expert advice on the designs of posts and foundations for all sizes of road signs – along with advice on suitability of individual proposed locations for signs. This value engineering advice can save clients substantial expense and help in getting the design right, first time. Engineered and developed by Mutoh Europe, the Zephyr TS UVIJ is a robust UV inkjet printer for the professional traffic sign manufacturer, designed for use with RBYK UV inks specifically developed by Nippon Carbide Industries (NCI) to print onto Nikkalite retroreflective sheetings. 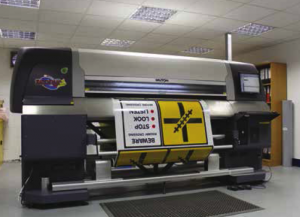 Print on demand flexibility from the Zephyr TS provides traffic sign manufacturers with a professional, high quality, lower cost and efficient digital printing solution for Nikkalite retroreflective sheetings. The Zephyr TS is designed as a roll to roll printer and integrates numerous high tech features to deliver print on demand with outstanding high gloss print quality at an impressive 12 linear metres per hour (16m2 per hour based on 1223mm roll width) onto Nikkalite microprismatic and glass bead retroreflective sheetings. Nikkalite retroreflective sheetings fully comply with the visual and physical requirements of IS EN 12899-1; 2007, after over lamination with Nikkalite protective overlay sheetings and are warranted for up to 12 years.